Black, white and green Vegan themed badge. 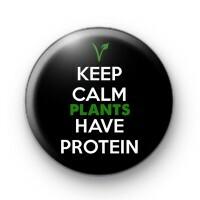 This has the text Keep Calm Plants Have Protein. If you eat a Vegan or Vegetarian Diet & get fed up with people asking the same question about your protein, then you need this badge. Just to let the world know you get your protein from PLANTS! We have a huge selection of Vegan & Veggie themed badges in the shop so be sure to check those out too!